Silver nanoparticles (AgNPs) were synthesized from aqueous AgNO3 precursor via an effective and ecofriendly method using Lemon Citrus Latifolia (LCL) extract as the reducing and stabilizing agent under sunlight condition. 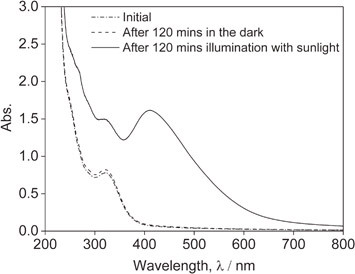 The AgNPs formation was confirmed by ultraviolet-visible absorption spectroscopy at the wavelength of 400–450 nm. The appropriate conditions and positive effect of direct sunlight on the AgNPs preparation were revealed clearly. The synthesized AgNPs were characterized using multitechniques X-ray diffraction revealed that AgNPs had the crystalline nature of face-centered cubic structure. Scanning electron microscopy and transmission electron microscopy showed the obtained AgNPs was spherical and the size distribution was uniform with the nanosize of 4–24 nm. The obtained AgNPs solution showed an effective antibacterial activity against E. coli, B. subtilis and B. cereus with the average diameter of inhibition zones over 15 mm.